One of the joys of Shabbos is that it comes 52 weeks a year — the fun is making it delicious every time! CELEBRATE will help you do just that, with more than 200 crowd-pleasing recipes that are easy enough for everyday, and special enough for Shabbos. You'll find tips for making meals ahead, freezing, re-warming, and ingredient substitutions for making almost every dish Passover perfect. Each week thousands of followers turn to author Elizabeth Kurtz's highly acclaimed website, GourmetKosherCooking.com, for their favorite kosher recipes. In CELEBRATE you will see why! "This book is full of vibrant photographs that make your mouth water. The recipes all have a unique twist, and at the same time are easy to follow and approachable for the home cook." "Elizabeth's signature elegance and sophisticated style, along with her easy-to-prepare recipes are definitely something to CELEBRATE. The exquisite photos, helpful hints and tips will make this book cherished for years to come." 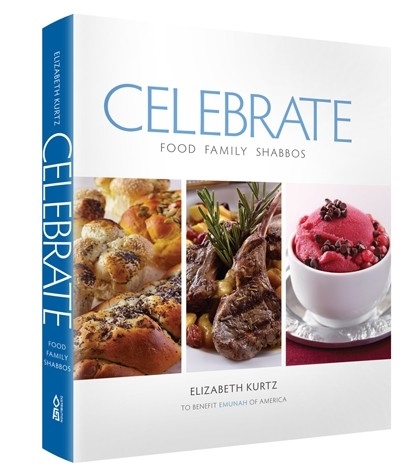 "Elizabeth Kurtz's CELEBRATE is an inspiring collection of easy to follow recipes with fabulous photos and helpful hints for the home cook. These are great recipes you'll want to make every day." "Elizabeth has been inspiring her readers (and me) for years. With CELEBRATE, Shabbos just became a lot more delicious!"